Today I got a lot of numbers done. On the screengrab attached, I don’t have all of today’s numbers white… just a few more reps to do to finish today. But still totally slacking on the bar precisions. DAMMIT tomorrow I’m gonna get on it!! The bar pre numbers for the rest of this week are gonzo… I know I can do them, just need to get in gear. Yellow blocks are “planned”, blue is “interesting mile post”, and red is “danger/training obstruction ahead”. Saturday I’ll be away in upstate NY for some Parkour so I’ve cleared that day with zeros. But I suspect I’ll be tired Sunday — I’ll be driving home 3 hours, and there’s regular class in the afternoon. So I should clear Sunday as well. I’ll see if I can “bank” things. But “banking” 180 bar pre’s will not be easy. Bigger picture, this means (if I can pull off this week) I only lost about 9 calendar days of slippage to my recent got-sick-and-then-became-a-slacker slide. 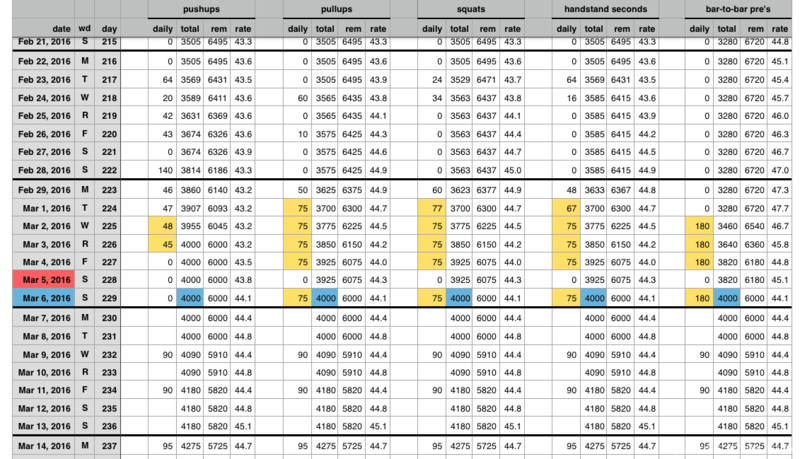 On the other hand, 720 bar precisions in the next 4 days… that’s probably a wee bit ambitious.